1. High quality, energy-efficient, environmental protection. It provides a powerful support and a guarantee for the green high performance concrete production. 2. Closed green gravel transport systems, reducing noise pollution at most. 3. Negative pressure pulse bag filter, completely solved the problem of flying dust, environmental pollution in concrete production, efficiently save resource, protect the environment. 4. Concrete separation recovery device, adopt three dimensional arrangement, formed a new set of enclosed sewage treatment and recycle sand, stone system. Make water and waste material reusable, meet zero-emissions goal. Possible to save resources, reduce pollution and consumption, environmental management has always been the company’s thinking. 5. High-precision weighing system. The world well know brand with high quality and stability are used for most main components. 6. 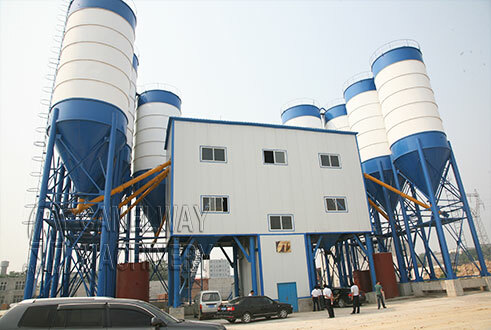 The concrete mixing plant have high availability automatic microcomputer control system, advanced industrial computer, programmable logic controller, LED’s display. The system can realize control of the automatic, manual control. The system is simple to operate, and user-friendly , highly reliable and agile for application. Proprietary weighing technology ensure the accuracy and reliability of the measurement system. Intuitive monitoring control, accurately simulation the workflow.